Being a startup, we have always managed to keep our operational costs low and having a low or rent free location was one highly favored recommendation that has proved fruitful since. With several of our employees working comfortably from their homes we have now successfully cut down our costs to a great extent. But were left with another great solution to deduce – an efficient collaboration software where all our employees would update their work status, can share all necessary information, get their doubts clarified or even suggest ideas. Researching online we left no stone unturned and finalized on a set of team collaboration tools or software that are economical and proved quite productive as well. And with a whole list of applications that we already use integrated in these softwares; we no more use the normal instant messaging apps for our work queries. No more messy messages or emails. An easier way to hold a meeting at a place and time that convenes everyone. A team collaboration tool or software simply works like a messaging app. It’s the tool’s integrations and features that matter. 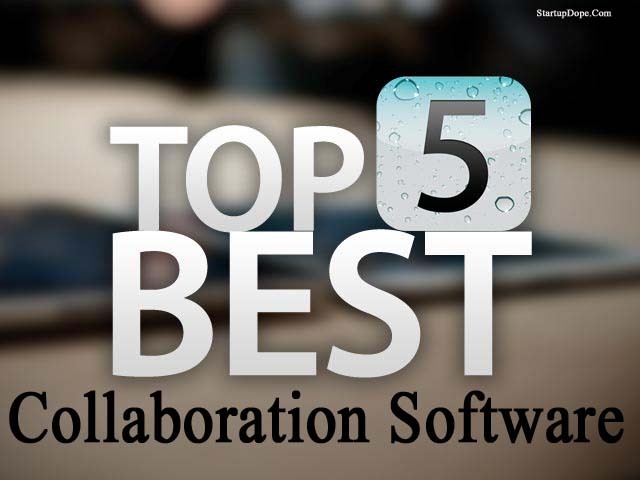 And figuring the need of an effective team collaboration for every business, here is a list of the top team collaboration software that an organization of any size can benefit from; especially startups. As the successor to all team collaboration tools and with features surpassing its predecessors; GroupRocket – the new collaboration software in market is all set to assist every business; big or small. And with the software, you can now create your own niche chat app for your business right away! Coming with full source code, the software comes with free upgrades for life as well eliminating the need for you to worry about your application’s compatibility every time your operating system is upgraded. The software coming as two versions; a web version and as an iOS app, comes integrated with Stripe, Dropbox, twitter, Github and Mailchimp and with the APIs provided several other integrations can be added to the software. Registering at the app or site with an invite through Mandrill; the users or employees can manage their profile – set a picture, change time zones allow notifications and more. Allowing notifications, always be aware of all your team members’ activities and get notified on your activity as well. A brilliant feature to know when your friend or colleague plays a prank on you. Set different channels and groups and monitor all your employees’ activity at their workplace and give them a platform to converse with people in different teams and notify them on any updates on the projects they are working on. Removing a team member or adding a new one? Manage your team effectively and quite comfortably with GroupRocket. Users can share private messages with their teammates or create private groups and share updates and work progress to everyone in the team. From uploading and sharing any file in any format to having push notifications and channel settings, the software comes with almost similar features at both of its versions and with its exceptional search feature, view a message or a file a colleague has shared several months ago. And now to the best part – the pricing. Buyers get the iOS and web version of the collaboration software with full source code and free future upgrades for just $399. And for an additional $199; the buyer gets expert installation from setting up the software in their server and having it up and running. The best bargain you can ever get. The team collaboration software that has been quite successful in the business with almost 8000 customers within just a day of its inception. With private messaging and group chat features, the software also allows users to create chat groups. Integrated with several apps from Google Drive, Heroku, Dropbox and more; the software supports several community based integrations as well. With the recently added emoji feature similar to the normal messaging apps and features to share voice messages, video and share screens, Slack has given its users a much more comfortable platform to chat or discuss with their teammates in a stress free and fun way. The software coming as an app for iOS, android and Mac devices also comes as web version for the desktop users and as a new release comes for the Apple watch as well. With its sync feature, you no longer have to remember any action you perform when you use a mobile version and then make the changes at the browser. All changes will be updated on all your devices and you can archive your team chats or files and have access to them anytime and from anywhere. From Airbnb and Buzzfeed to eBay and NASA, the software has numerous customers and comes as a free and paid version where the paid version comes with several added controls and features. Several collaboration softwares may come and go, but one can never discard the very first and the best application Google mail (Gmail); that provided chat features with its ‘Google Hangouts’ and provisions to create and share multiple files to every person in the team and with the management as well with their ‘Google drive’ feature. And with, ‘Gtalk’ users can make numerous calls to their contacts for free. This instant messaging app for team chats within an organization comes as a real time communication platform where employees can communicate with their clients effectively thereby increasing your team’s productivity and cutting down unnecessary charges and issues. Create groups and chat with all your team-mates or chat with individual employees with the private messaging feature. The software coming with the share feature and allowing users to share any number of files in any format now comes with video calling features as well. You can share your screen, schedule a meeting or better – hold the meetings through the video conferencing feature, the software provides. With real time communication and security features that can stand toe to toe with those of financial institutions, Redbooth accounts for better team management and collaboration and now comes as a 30-day trial version. Yet another instant messaging platform that fits as a perfect solution to an organization’s team collaboration software issues. With simple yet useful features like spell check and bookmarks, the software comes with better security and a great end user experience. Coming as mobile applications for android, iOS and a web version; the software comes with features where users can express themselves as avatars and share unlimited images. A fun filled messaging software any organization can get. Previous articleChange Your Mind, Expand Your Business – It’s all in your head. Next articleShould You Drop Out of College to Startup?